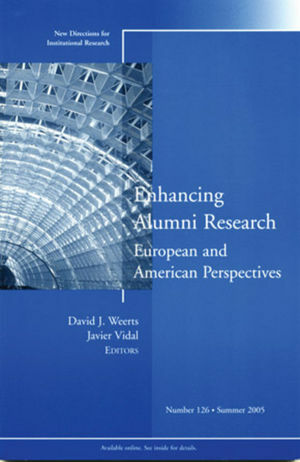 The chapter authors examine ways in which alumni research in the United States and Europe is becoming more relevant to key audiences outside the university and how it is being used to inform important constituencies about the impact, purposes, and successes of higher education. The goal of this volume is to help institutional leaders use alumni research to respond to the increasing demands of state officials, accrediting agencies, employers, potential students, parents, and the general public. This is the 126th volume of the Jossey-Bass higher education report series New Directions for Institutional Research. Always timely and comprehensive, New Directions for Institutional Research provides planners and administrators in all types of academic institutions with guidelines in such areas as resource coordination, information analysis, program evaluation, and institutional management. David J. Weerts is assistant professor of higher education at Florida Atlantic University in Boca Raton, Florida. Javier Vidal is professor of research methods in education and vice rector for planning and institutional assessment at the University of Leon, Spain.